Foreign body reactions elicit granulomatous inflammation composed of reactive macrophages. We hypothesized that [125I]iodo-DPA-713 single-photon emission computed tomography (SPECT), a low-molecular-weight pyrazolopyrimidine ligand selectively trapped by phagocytes, could be used to detect foreign body reactions in a murine model. C57BL/6 mice intratracheally inoculated with dextran beads, which developed foreign body lesions, were imaged after injection of [125I]iodo-DPA-713 or DPA-713-IRDye800CW using SPECT and optical imaging, respectively. 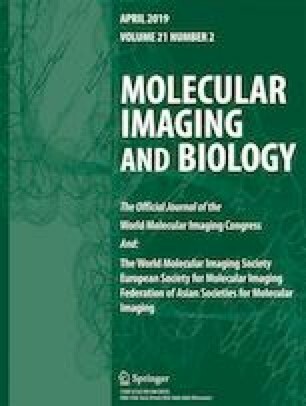 Foreign body lesions were clearly observed in the lungs of the dextran-treated mice on computer tomography imaging and demonstrated significantly higher [125I]iodo-DPA-713 uptake compared with control animals (p < 0.01). Ex vivo studies demonstrated granulomatous reactions in the lungs of dextran-treated mice and localization of DPA-713-IRDye800CW at the diseased sites confirming the imaging findings. Radioiodinated DPA-713 may be used as a noninvasive biomarker for the detection of pulmonary foreign body reactions. The online version of this article ( https://doi.org/10.1007/s11307-018-1249-0) contains supplementary material, which is available to authorized users. This study was funded by the National Institutes of Health (NIH) Director’s Transformative Research Award R01-EB020539 (S.K.J.). The funders had no role in study design, data collection and analysis, decision to publish, or preparation of the manuscript.